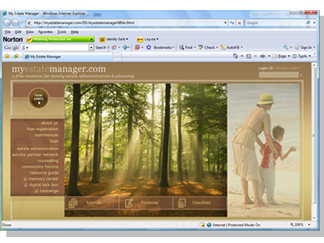 MyEstateManager.com was a new company that was focused on building the premier website in the industry for offering free information to people who recently lost a loved one and needed guidance on estate management. The business model was based around attracting service providers such as funeral homes, flower shops, etc., that paid a subscription fee to be listed in the directory and advertise on the site. MEM needed to prototype the best way to sell their program to service providers. The sales prototyping program was broken up into several test subprograms. One assigned senior sales reps to sell the program to their own network. Another used experienced inside sales people to call the businesses that were initially listed in the directory. A third emailed to a list with an invite to a webinar and let the webinar sell the concept and demo the site. PR activity was also done to create a groundswell of awareness in the community. The senior sales reps did a great job in finding contacts and presenting the program. By having senior people do this, a lot was learned about needed product features, pricing, messaging and sales approaches. A number of hot prospects were identified, some closed and a recommendation on next best steps was developed. The inside sales reps had to depend more on the product than the senior sales reps who sold mainly to their own network. As a result, this program became more sensitive to needed product features, evidence of visitor traffic, etc. After a month of initial testing with this program, it was decided to put these resources on hold until further product features and website traffic were completed. The third program that focused on a webinar was done in two ways. One webinar was marketed to a purchased list. Lots of emails were sent out and attendance ended up around 20. A second webinar was pitched to an Association audience where the members were invited by the Association. The latter had double the attendance and a lot more interest at the end. The experiment helped to flush out the need to focus on the one-to-many sales model that resulted from working with associations. Next steps were designed to recruit associations, get them to agree to a webinar to their members, manage the logistics of the webinar and follow on. Sales could then focus on hot prospects instead of cold lists.